I have to start somewhere with the actual prepositions in the Rhizo14 auto-ethnography, so I will cherry pick a sentence from the accounts written by Maha Bali and Sarah Honeychurch. A few months ago, I became aware of some online textual analysis tools from Voyant Tools, but this is the first chance I've had to use them. I am by no means competent with them yet, but they are already proving useful and promise to be even more useful. I recommend that you check them out if this sort of thing interests you. I will imbed some of the tools in this post to give you a sense of what Voyant has to offer. The tools are live, and should the written texts change, the results would change. That could be helpful. So Maha wrote 977 words, of which 398 were unique (59% duplicates, 41% unique). Her top 10 words include 2 prepositions: to (21/2.2%) and on (16/1.6%). However, at least 9 instances of to are infinitive markers (ex: to express, to echo); thus, on is the most common preposition for Maha. Sarah wrote 532 words, of which 267 were unique (50% duplicates, 50% unique). Her top 10 words include 3 prepositions: to (15/2.8%), in (14/2.6%), and of (14/2.6%). Again, however, 8 instances of to are infinitive markers (ex: to miss, to talk); thus, in is the most common preposition for Sarah. The basic movement of the sentence/scene is simple and runs along the bottom line of the image above: Funny enough, I am having a lot of difficulty writing here. This core sentence places Maha center screen as the main actor not only of this sentence/scene but of the entire movie, as evidenced by the occurrence of the word I 45 times (4.6% of 977 words). After all, this is an auto-ethnographic piece, which almost by definition makes the writer the main actor. There is not much action here, as even the writing is more indicative of framing thoughts than of manipulating a keyboard. So the sentence/scene is more a mood piece, presenting the main actor in some perplexity (funny) at having difficulty with writing (though, the implied wry humor of the term funny should definitely not be ignored, as it hangs like quiet laughter just off camera). Finally, the one preposition in this part of the scene, of, is more conceptual than active, denoting or pointing to a quality of the rather empty noun lot and, by extension, to writing. Here, of connects qualities to concepts rather than to any active times or spaces. Moreover, this preposition is not very functional given that it is unnecessary. Maha could have easily written: Funny enough, I am having great (or much) difficulty writing here, to replace the casual construction a lot of and eliminate the preposition. This core sentence, then, presents us with the main actor and a bit of emotional and mental atmosphere, but not much else. All of the stage craft is done in the rather long, parenthetical subordinate clause: even though I have been thinking about this since #rhizo14 started and writing about it throughout on my blog, fb, twitter. This is the part where the prepositions arrange the movie set, defining the space and time in which Maha thinks and writes, connecting her to a setting, other entities, and other actions. The twin prepositions about function as references or pointers linking Maha's thinking and writing to the Rhizo14 auto-ethnography, which is a major player in Maha's movie. The complementary prepositional elements since and throughout provide the temporal scope of Maha's movie: from the beginning of Rhizo14 proper through to the end. Finally, the preposition on provides the virtual space where Maha's writing takes place: her blog, Facebook, and Twitter. This is quite economical stage craft, placing Maha in a specific space and time and connecting her to the Rhizo14 MOOC and to the Rhizo14 auto-ethnography, major entities in her movie. I’m in the early stages of a part time PhD in collaborative learning and I got interested in MOOCs from that point of view, as well as because my Uni signed up with FutureLearn last year. 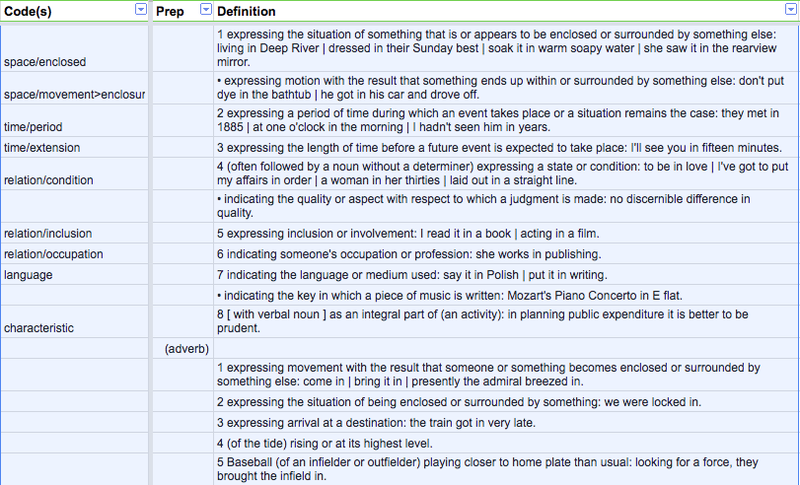 This 36 word sentence/scene has 7 prepositions (19.4%), including 3 instances of in. In addition, I could easily include the conjunctive phrase as well as (relation/additional) and the adverb up (process/completion), but I will arbitrarily limit this discussion to the 7 traditional prepositions. Sarah is also setting a stage for herself, but this is her second sentence, and the first sentence introduces Rhizo14, a major player in her movie: I can’t remember how I found out about rhizo14, probably from Dave’s blog. Her second sentence, the one I am using here, explains how she became interested in MOOCs such as Rhizo14. 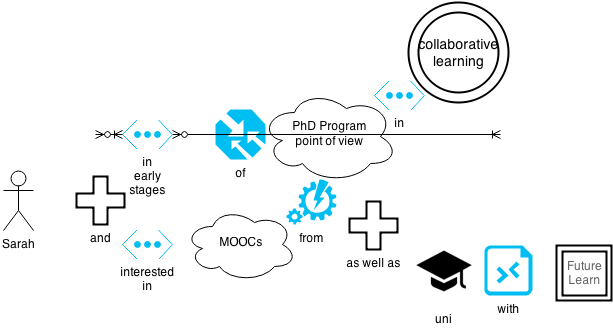 Sarah is tracing the origin of her interest in MOOCs first to a PhD program in collaborative learning and then to her university's recent agreement with FutureLearn, a UK online learning group. As with Maha's sentence, Sarah's use of I 26 times (4.9%, about the same frequency as Maha) places her center screen in her movie. Again, she's writing an auto-ethnography. She is supposed to be the star of the movie. The scene begins by situating Sarah in the early stages of a PhD program in collaborative learning through the use of 3 successive prepositions: in with its spatial, temporal, and membership connotations, of with its thing > type relation, and in which has both thing > type relation and reference connotations (she could have easily used the preposition about here). For Sarah, then, Rhizo14 is occurring at the same time as her PhD program and is occupying some of the same intellectual space as collaborative learning. At its conclusion, the sentence extends this setting by adding Sarah's university and its partnership with FutureLearn with the conjunctive phrase as well as and the preposition with. The preposition in connects Sarah's interest in MOOCs to her PhD program and to her university activities. When first considered, the sentence has a rather odd structure: Sarah's interest in MOOCs is framed at the beginning of the sentence by her PhD program and at the end by her university activities, but given the use in 3 times and given the common connotation of enclosure for that preposition, it's easy to see how this structure, even if unconscious on Sarah's part, is appropriate: her interest in MOOCs is in, within, inside her PhD program and university activities. It's also odd that not one of the uses of in in this sentence primarily implies enclosure; rather, they imply a thing/type relation, a reference relation, sequence, and membership. Still, the sense of enclosure is also there, humming behind the main thought, latent, potential, ready to hand if a reader wants to look closely enough, listen carefully enough. And this sense of enclosure enriches the entire scene, giving it more meaning for those who want it without imposing its meaning on more glib readings. This will sustain more thinking and writing. I'm traveling on the road for the next two weeks, and my posting may be erratic, but I want to send this up before I become distracted. I have much more to say about meaning as an emergent property of many words rather than an irreducible quality of one word, but this is a decent start and gives me some concrete things to work with. And yes, even though I'm a southerner, I know that I'm not supposed to end sentences with a preposition, so: this is a decent start and gives me some concrete things to work with, ya'll. 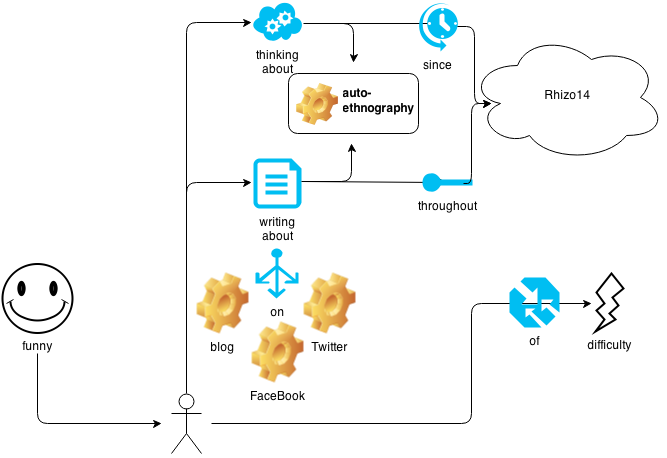 I promised in my last post to talk about why and how I was coding the Rhizo14 auto-ethnography with prepositions. Maha Bali subsequently pointed out in a tweet that she still doesn't know how I plan to code prepositions. She's right. I spent all of my time yesterday talking about why and very little about how. I ran out of steam last night, so I want to correct that. I'll start by talking about what I did, which may not be logical, but I'll try to put things back together at the end. Also, I am not so methodical. I tend to do all steps at the same time so that for a long while my work is very messy. Order emerges slowly. The reasonable order implied below by first, second, third steps is a fiction of my writing, not what actually happened. First, I read the entries by Maha Bali and Sarah Honeychurch to identify all the prepositions. I thought this would be a simple task, but it was not. I missed many of them, even obvious ones such as on, in, and so forth. They are little words, bare snippets, and easy to overlook. Moreover, I think my brain is accustomed to overlooking them, trained instead to look for the substantives and verbs, the actors and actions in a sentence. The connective words tend to recede into the background, lost in the noise, while the actors strut across the stage in shining, privileged relief. It's a bit like being the bellboy who delivers the note to Tom Cruise in some movie. No one remembers the bellboy's face, and he never has a name; they are blinded instead by His Magnificence center-screen. Prepositions are the bit players in sentences, but the sentences don't work without them. I'm having to retrain my brain to notice them. I find this very odd. Obviously I would include the second in, but what about the first? In traditional grammar, it is an adverb because it modifies the verb; yet to my mind, it seemed to be doing a prepositional thing: expressing movement through space/time to connect entities. I will have to do more research to confirm this, but I suspect that traditional grammarians are privileging the substantives and verbals and defining the little words, the bit players, by their relationships to the main actors and actions, rather than defining the little words in their own rights. Thus, in is a preposition when it relates to some substantive, connecting it to some other main part of the sentence; it is an adverb when it relates to a verbal. It seems that the identity of little words depends not so much on their own behavior and role as on their relationship to the main words, the important words. I decided to include the adverbial in along with the prepositional in. I admit up front that sometimes my choices to include or not may appear arbitrary, but I hope to develop some rigor through working with the choices. Rigor may come, or not. having a firm basis in reality and therefore important, meaningful, or considerable. having a separate and independent existence. This seems to capture the general English attitude toward nouns: they have a firm basis in reality, a separate and independent existence, they are real things, and thus they are important, meaningful, or considerable, worthy of consideration. Prepositions don't have that definite solidity. They have the slimmest basis in reality and almost no separate and independent existence, so they must be unimportant, meaningless, and unworthy of consideration, right? Well, it seems that I once thought so. This will require a post of its own, a line of flight, later. I know I have readers who speak languages other than English, so I'm curious about how those languages treat the little words. Is this an English thing? a Western thing? a universal thing? I don't know. Coding for the preposition "in"
Note that I coded in the early stages as time/enclosed, indicating that in indicates a temporal enclosure, placing Sarah within one of the successive stages of a PhD program. This code is a bit too loose and could easily be managed otherwise. I could as easily use a code such as time/succession to indicate that Sarah is at a particular time in a succession of times. Which would be correct? Well, they both are. Is one better? I don't think so. So how do you code in, in this case? Is it a particle or a wave? It's both, and maybe something else as well. My reading suggests that cognitive linguists are having the same issues with devising boxes big enough to contain all the possible meanings of these little words. It seems we can say the most with the least, and that makes things interesting, problematic, very rhizomatic. So I am not at all settled with my codes. First, I think the dictionary definitions are somewhat arbitrary, which makes my codes arbitrary of necessity. If I stick with this line of thinking, I'll have to do lots of work here. Then, I just noticed that I've been using mostly substantives for codes (space, time, relation, reference, etc. ), thus privileging the substantives again and creating static snapshots of what is basically a dynamic connection within a sentence. I could use verbs, which would re-animate the code, but it still privileges a different class of words and a different semantic structure. I'll have to think through all of this, and I'm not there yet, but I'm reading my way onto some possible paths. I want to continue writing, but I have lots of end-of-term documents to grade, so I'll stop here. Next I want to give an example of how I'm parsing and analyzing a sentence with these codes, with the hopes that the other coders will begin to see some connections between what is emerging here with prepositions and what they are doing with their own codes. This line of research is going somewhere nice for me, but I still don't know if it will play well with the other over-codes. I never expected to be writing about prepositions, but it's the approach I've decided to take with the Rhizo14 auto-ethnography, so I want to sketch what I think I'm doing and why and how I'm doing it. This is a preliminary sketch, so expect abrupt turns of the page and new, emergent directions. In rhizomatic terms, expect lots of deterritorializations and reterritorializations. If you've ever heard the ruffle and rush of a covey of quail scattering in the cold, steel-blue dawn, then you're ready. I became interested in the rhizomatic potential of prepositions after reading the conversation between Bruno Latour and Michel Serres in Conversations on Science, Culture, and Time (1995), in which Serres talks about his "'philosophy of prepositions'--an argument for considering prepositions, rather than the conventionally emphasized verbs and substantives, as the linguistic keys to understanding human interactions." It was an intriguing concept, but I didn't have a concrete way to engage it until the auto-ethnography emerged. A group of us decided to independently code the entries in the auto-ethnography, and then compare our codings. I jumped at the chance to work the prepositions, and I assumed that most of the other coders would base their coding systems on substantives and verbs as "the linguistic key to understanding human interactions." I had an intuition that prepositions, and prepositional-like elements, might be the linguistic engines that power the rhizome in language. What do I mean by that? For me, rhizomes are first about connections: making connections, dropping connections, arranging connections into patterns. At its deepest level, the rhizome itself is all possible and potential connections (and even the impossible connections, in a kind of indiscriminate heterogenous coupling and tripling and clustering)—in Serres' terms, it's noise—but humans inevitably select, reduce, and map, bringing a few nodes into relief from the swelter of possible nodes and constructing patterns out of those nodes. Those patterns are what we mean by meaning. Language is one of the core tools we use to map our worlds and to create patterns—both helpful and harmful, rational and whimsical—and prepositional-like elements are the hooks, angels, hermes, and messenger particles that connect the actors (nouns) and actions (verbs) of our thought and arrange them. An early metaphor that emerged for me was prepositions as stage directors, positioning actors on the stage, giving directions about which way to move in relation to other actors, props, audience, and the stage itself, and ramping up the next scene. They are very busy, and they have to know everything. Yup—those little, largely ignored prepositions. Prepositions are the connective, connecting tissue that connects this to that in a pattern that works and makes sense. It's a really big job. I notice how connections suddenly come alive, dormant for indeterminate time they suddenly fire and images, words, ideas flow out. This appears to be learning. I virtually never write, I never write what I think, imagine, or foresee I am going to write. I am written. In more prosaic terms: how do prepositions drive the emergence of a sentence into meaning? How do they both coalesce (inward) the potential energy of nouns and verbs into coherent structures AND vibrate (outward) with enough heat to trigger the emergence of larger structures of meaning that flesh out our ideas? This is a very subtle trick, and I'd like to know more about it. Along the way, I think I will learn more about the rhizome and how it can lead to community and away from community. We'll see. So I'm starting to read about prepositions, and I'm finding a fairly deep if not extensive body of work about them (or on them? which preposition do you prefer here: about or on? it makes a difference. you be the director and make the call). Of course, I'm having to learn a new vocabulary, pulled mostly from cognitive linguistics, where I'm bumping into George Lakoff again, and one of my first new words is polysemy (many possible meanings for a given word). It seems that prepositions just won't take a definition and stick to it. This is driving some really bright and otherwise normal scholars nuts, including Mr. Lakoff, as they search for boxes big enough to put a tiny preposition in. It's similar to what quantum physicists went through when they first started realizing that electrons just can't be pinned down to one place and one speed. Elementary particles such as electrons are frenetic, jittery, smudged, probabilistic entities that most likely exist here but could also be someplace across the universe. Messenger particles, hermes, angels. Prepositions, too, are frenetic. They most likely mean this, but they could mean something else as well. They could mean multiple things at the same time. They violate Aristotle's principle of the excluded third. How messed up is that? Old-fashioned grammarians hate this kind of imprecision and waffling, but it's perfect if you want to explore the rhizome, as I do. This is very much like elementary particles: it's the frenetic jitteriness and vibrations of those tiny strings that make them imprecise (not reducible to a single, well-defined point) and that generates the energy that fuels the universe. Likewise, prepositions have a frenetic energy that fuels language such as this blog post. Prepositions are easy to overlook. I first went through the auto ethnographic entries by Maha Bali and Sarah Honeychurch merely to identify all the prepositions they used. As I was going back through to code each preposition, I found more—not the weird ones, but the common ones: on, of, in, and the like. Easy to overlook, but we lose much when we do. I don't want to suggest any disparagement of nouns and verbs, but prepositions have caught my attention for the moment. I want to see where they take me. So far, it's been a fun ride.